Australia’s history is rich with medical research discoveries and achievements that have benefited the health of people everywhere. The following medical research success stories occurred here in Australia and have helped millions of people worldwide. Professor Ian Frazer and colleagues from the University of Queensland Diamantina Institute developed the human papillomavirus (HPV) vaccine for the prevention of cervical cancer. The vaccine protects against the four types of HPV that cause 70 per cent of cervical cancers and 90 per cent of genital warts. This vaccine was developed in the laboratory, and clinical trials to test the vaccine used thousands of healthy female volunteers. To date, more than 65 million doses have been used worldwide to prevent HPV infection and save future generations from cervical cancer. 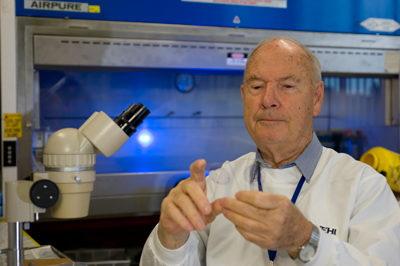 The discovery of hormones that regulate white blood cells, called colony stimulating factors (CSFs), was made by Professor Don Metcalf from the Walter and Eliza Hall Institute. Professor Metcalf showed that CSFs tell stem cells to multiply and mature to boost the immune system, which is needed by the body to fight infection. CSFs have now helped more than 10 million cancer patients to better tolerate chemotherapy, improving patient wellbeing during treatment and allowing more patients to complete their treatments and maximise their chances of surviving cancer.